Now i don't know of or have heard of any Vietnamese films but i had heard of Johnny Nguyen because of Tom Yun Goong ,he fought Tony Jaa in the Hotel scene and mighty fine a fight it was too. So when i heard of this Vietnamese martial flick starring him and Dustin Nguyen i had to track it down ,Now i had seen it advertised as a forthcoming DVD from Dragon Dynasty but was not out yet and some of the other versions are not available as the film was made in 2006/7 ,Any way i found a seller on eBay selling a version i think made for the Spanish market as all their films have Spanish subs ,So it arrives and it has both Vietnamese and English Soundtracks (a bonus). But i think this was to emphasis how the French treated the Vietnamese at this time .After escaping from the mines but not before dishing out some justice they head for rebels villages . I wont spoil the film to much as when i review i like to not give it all away The thing is what happens on the way to the villages and there after will blow you away . From a production point of view this is a brilliant film and from the first five minutes you know your watching quality film making ,A lot better then many Thai films you might see purely because of the interesting story and passion that comes from this and the good acting . 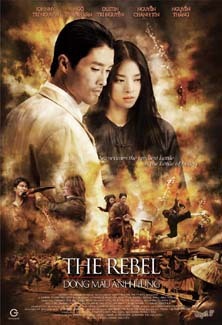 Now i watched this in both Vietnamese with English subs and in the Dubbed track and both were a joy to watch ,so without doubt this is one top film that has fights so well put together there as good as any Hong Kong movie and even though there not as frequent as some films when they happen they are worth the wait . All in all a top film ,that i will be watching again.and i can't wait till the next film from these people and the wait won't be to long as Dustin Nguyen is putting the finishing touches to his latest film Huyen Thoai Bat Tu (The Legend is Alive )were Dustin plays a mentally handicapped person who happens to be a good fighter .The film is said to be gritter in the fight stakes then the Rebel ,less flamboyant style.